The user interface is relatively intuitive, but helpful documentation with video guides are embedded within the product to facilitate use. 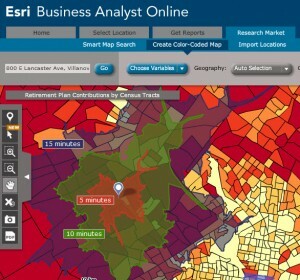 Both reports and maps can be generated. When we learned that the Department of Geography and Environment’s site license for desktop use could be extended at no additional cost to include web access, we coordinated with Guillaume Turcotte, GIS Laboratory Technician and Instructor, and he made the access happen. Thank you, Guillaume! 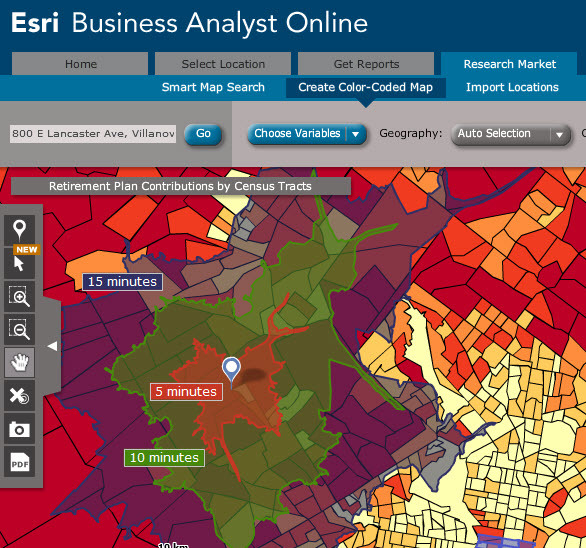 Esri Business Analyst Online is available on the Databases A-Z list and select subject guides. To access, authenticate with your LDAP, and create a personal user name and password linked to your Villanova email address.